Shakespeareances are all about the moments in which they are happening and the people creating what's happening in those moments. It’s become a trendy thing to do Shakespearean versions of the annual National Collegiate Athletic Association (NCAA) championship basketball tournament, affectionately known as March Madness™. In these Shakespearean iterations, instead of college basketball teams the brackets are filled with William Shakespeare's plays, which compete in a single-elimination tournament to the Final Four™ and eventual champion. It’s all virtual and all in fun. In reaction to these faux tournaments that emulated the structure but not the spirit of true March Madness™, I've conceived my own tournament of Shakespeareances which focuses on the playing more than the plays, so it is a true competition among theatrical experiences. 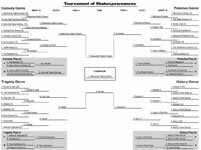 I also am inviting reader participation: e-mail me your favorite Shakespeareances to editorial@shakespeareances.com as we play out the bracket at the bottom of this page. When I came upon the first one a few years ago, I thought it was so cool I posted it on my Facebook page and took part in the “bracket pool.” But after two rounds I grew disappointed. The winning plays were chosen by a Shakespeare scholar and the tournament fell into a rut of inevitability leading to Hamlet being crowned champion. Scholars will almost always end up with Hamlet winning because it's such great literature, but that is not true March Madness, where upsets are the big part of the fun. I don't have enough fingers or toes to count the number of "greatest teams ever" that didn't win an NCAA tournament because other teams played better. Similarly, when it comes to theatrical experiences, Hamlet is not always going to play better than any other work in the canon—yes, any other (I've seen better Timons than Hamlets). With perhaps a bit more validity, other Shakespearean tournaments rely on reader or audience votes, but they predictably ended up with Romeo and Juliet winning the title. The real NCAA tournamentwould be madness indeed if its outcome were put in the hands of fan voting, as that takes the ball away from the players. Ah, the players. Just as the outcome of the NCAA tournament is dictated by how the games are played, the playing is the thing in my Tournament of Shakespeareances. My brackets are seeded according to how often I’ve seen each play, and winners of each matchup will be determined by my collective experience watching productions of each play. This is a key distinction from basing winners on my personal favorites: I expect two of my favorite plays to make early exits for the lack of enough satisfying performances, whereas an obscure play I’ve seen only once or twice might go deep into the tournament because of stellar productions. That is what puts the madness in the early rounds of the NCAA Tournament and why “Cinderella teams” advance as far as the Final Four. The outcome of basketball games depends on a variety of temporal factors, from an unknown player achieving greatness to a superstar falling on his or her face, from a stupid decision by the coach or player to a bad call by the referee. Similarly, Shakespeareances are all about the moments in which they are happening and the people creating what's happening in those moments. I have no idea how my own tournament will work out—as I write this sentence, I haven’t even worked out the seedings yet. True, on this website I have a list of my Top 40 Shakespeareances plus annual rankings, but those are individual moments whereas this tournament is based on collective staging. With the NCAA Tournament, pundits consider the rankings of teams and players in making predictions, and you could do the same with my lists. And yet, teams seeded 15 upset second-seeded teams, and teams seeded as low as 11 have reached the Final Four while only once in the entire history of the tournament have all four top-seeded teams made the Final Four (yet three times, none of the top seeds reached the Final Four). It will be fun to see in my tournament whether any of Shakespeare’s more obscure works have Cinderella runs (Helen runs?). This is my own private tournament, perhaps, but I’m playing it out in this public space with two ends in mind. One, I want to present a tournament where the emphasis is on staging Shakespeare, not merely on reading and studying, falling back on tradition, or generally knowing some plays while being vaguely aware of other, seldom-seen plays. Two, that you play along with the fond memories of your own Shakespeareances; I invite you to weigh in and perhaps have a fan’s influence on the outcome. The field for the Tournament of Shakespeareances is divided into four genres: Comedies, Tragedies, Histories, and Tragical-Comical-Historical-Pastoral (we’ll call that the Polonius genre). Expect some fudging. I am limiting my field to 40 works, with two play-in matches in each genre. That gets me to 32 works for the first round and on to a Sweet 16, Elite 8, Final 4, and ultimate champion. To qualify, a work must be universally recognized as part of the official Shakespeare canon, which comprises 38 plays, three narrative poems, and the Sonnets. This is my selection committee’s first controversial decision, because it leaves out two plays I’ve seen that are attributed, in part, to Shakespeare: Cardenio (Double Falsehood) and Edward III. Though I enjoyed the Atlanta Shakespeare Tavern’s production of Cardenio, the version of the play that has come down to us doesn’t have much Shakespeare left in it (if any Shakespeare was there in the first place). Denying Edward III is a more painful call because Shakespeare’s hand clearly emerged in the staged reading I saw performed by the Shakespeare Project of Chicago. As for the works in Shakespeare’s official canon, I’ve never seen any staged performance of The Phoenix and the Turtle, so that one by default doesn’t make the cut. Also missing out on my tournament are the Sonnets. My argument is that I do not consider them a narrative, though many critics and scholars believe them to be an autobiographical narrative (I’m not convinced—Shakespeare could have written the Sonnets as work-for-hire in a manner played out in an Edward III scene that has been attributed to Shakespeare). When pitting play against play in this tournament, I will compare the overall impact of each work as I’ve seen them produced for the stage, screen, or radio. Any inputs I get from my readers will influence closely contested matchups: depth often proves the difference in basketball games that go into overtime. Send me your own fondest Shakespeareances or cheer for a play in a particular matchup (e-mail to editorial@shakespeareances.com), predict the winner, or fill out these brackets with your own Shakespeareances to compare with mine. The grand prize: a community’s collective recollection of great Shakespeareances.